Stock Images from The DW Stock Picture Library, Australian Photo Images. 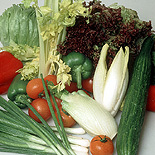 STUDIO IMAGE OF CUT VEGETABLES (LYCOPERSICON). 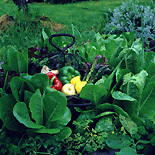 MIXED FRUIT AND VEGETABLES INCLUDING APPLES, PUMPKINS, BROCCOLI, PEPPERS AND STRAWBERRIES.